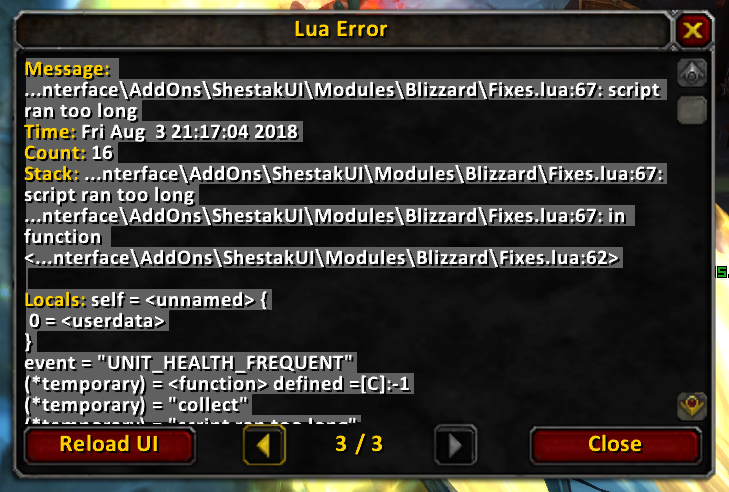 Every time I get into a big fight in a battleground i get this lua error and my game freezes completely and i have to alt + f4 and reload. This error is not informative. That code simply removes the garbage. If an error occurs in the script for a long time, an error occurs, but the code itself can not cause an error. In which case it must be one of the other 2 errors that is causing it but I cannot check what they are (unless they is some sort of error log to cycle through LUA errors that I am unaware of?) because the only way to fix this is to alt + f4 as the game is completely frozen when it happens. I have a feeling that it could actually be an addon called AllTheThings that is causing this, I am going to remove it and test it again later today. This was an issue with AllTheThings.